Fungal tree diseases are not treatable in a curative fashion; therefore, management efforts must focus on prevention. The best defense against tree pathogens is maintaining a healthy tree. Selecting a healthy tree and ideal planting site, as well as, watering during periods of drought and fertilizing all contribute to maintaining healthy trees. Using fungicides are essential to control and inhibit the growth of fungi that cause certain foliar or shoot diseases, but are effective only before infection occurs. Use organic fungicides or anti-fungal spray, sealer or dressing to prevent the tree from being vulnerable. When pruning, make sure to cover all open areas to prevent fungus and other agents from getting into your tree and causing fungal diseases, which include scabs on fruits, powdery mildew on leaves, rust on leaves and fusarium wilt. Applying sulfur to affected plants at the first sign of symptoms will help prevent spread of disease to unaffected areas and new growth. Repeating treatments is necessary when left untreated too long. Lime sulfur is helpful in preventing fungal disease on trees during spring, as leaves and buds start to appear. Mixed with dormant oil, lime sulfur becomes more effective in late winter or early spring before any growth starts. Spray as mixture runs off. Creating a baking soda spray by mixing baking soda with water, dormant oil and dishwashing liquid is effective against black spot and other fungal diseases when applied liberally. Milk is an effective combatant against powdery mildew. Using 10 to 20 percent milk to water ratio helps boost the plant’s immune system to fight off fungi that cause powdery mildew. Chemical treatments can help prevent fungi, such as scabs on fruits, powdery mildew on leaves, rust on leaves and fusarium wilt, from infecting and spreading on a healthy tree. There are two types of chemical fungicides--non-systemic (contact) and systemic (surface). Applying non-systemic fungicide to the foliage prevents and halts infection by forming a protective shield around and outside the tree. 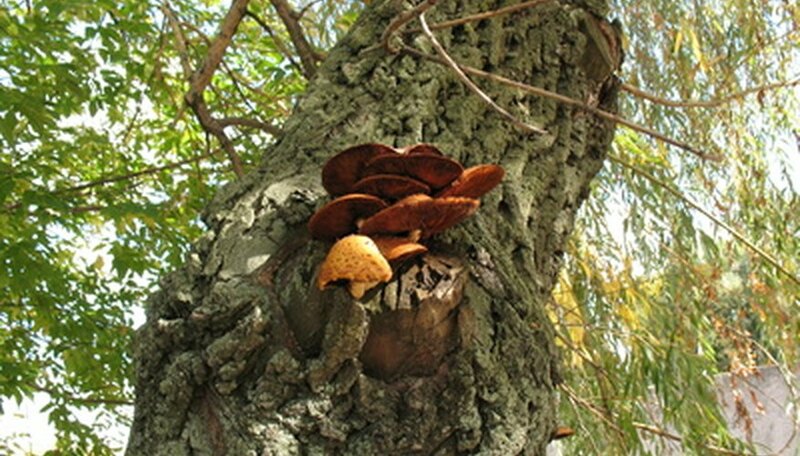 Removal of foliage (pruning or shedding), weathering (rain or water) and photodecomposition can diminish the strength of a non-systemic fungicide. Non-systemic fungicides include, but are not limited to, anilazin, captafol, captan, chlorothalonil, dichloran, ferbam, maneb, terrazole and zineb. Systemic fungicide also offers an external barrier to infection after application to the foliage; however, the plant absorbs this type of fungicide into its system for better protection. Benomyl and thiophanatemethyl are systemic fungicides. Systemic fungicides are not advisable for trees that bear edible fruits. Good air circulation, sunny locations and reduced water contact on leaf surfaces help prevent fungi growth. Removing affected leaves may also slow or prevent the spread. Digging up and destroying heavily infected trees will prevent the spread of fungi to healthier trees. Make sure to remove even the tree stump and roots. Do not shred and use the wood from cut infected trees to mulch other plants to prevent spreading the disease in your garden. Burning of infected trees is permissible in some cases or locations; check with your local fire departments for restrictions and proper methods.